Choose between the Dual Badu Stream Jet System or the Quad Swim Jet System to complete your TidalFit. The Dual Badu Stream Jet Systemjets offer a powerful commercial rated pump and control box. The patented square anti-entrapment cover provides undetectable pump suction, so you don't need as many water intake valves. The adjustable water flow and air regulators control the power and current of each jet. The Quad Swim Jet System comes with 4 Adjustable Swim Jets for a powerful current. The Quad jets are smaller and just as powerful as the Dual Badu, but they do not have the patented Badu water intake system. Instead, additional intake areas are needed at different points in the swim spa. 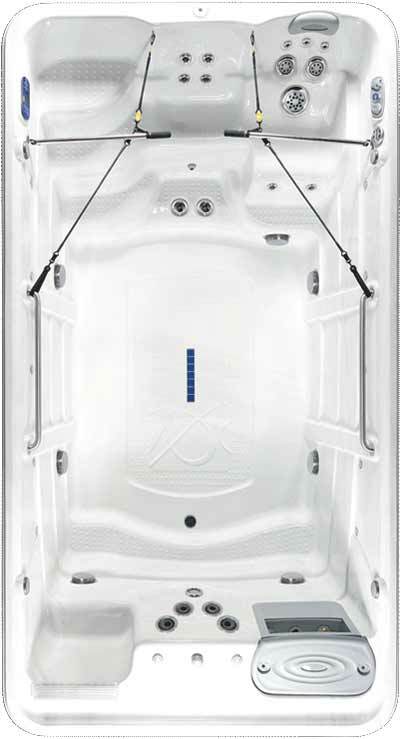 The DirectFlow Hydrotherapy Systemcan be added to turn your exercise pool into a relaxing and therapeutic pool.